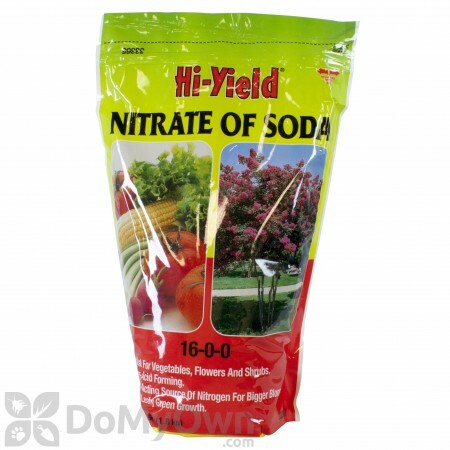 Hi-Yield Nitrate of Soda 16-0-0 is non-acid forming form of nitrogen that is fast-acting. 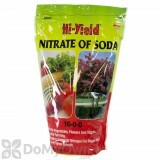 Use Hi-Yield Nitrate of Soda to promote vigorous growth and greener foliage quickly. Hi-Yield Nitrate of Soda is not intended or recommended for container grown plants. Do not allow product to come in contact with flant foliage. HI-YIELD NITRATE OF SODA is a fast-acting and non-acid forming source of Nitrogen that promotes vigorous growth and dark green foliage on vegetables, flowers and shrubs. Apply 1 lb. of HI-YIELD NITRATE OF SODA per 100 sq. ft. Work well into the top 4 to 5 inches of soil and water thoroughly. Do not allow granules to come in direct contact with plant foliage. This is not intended for nor recommended for container grown plants.